Last week, at the 24 Hours of Le Mans, a rookie from Leawood, Kansas made history. Scott Tucker was the first American allowed to race one of Audi's multimillion-dollar, 200-mph diesel prototypes. Amazingly, he was fast. one of its 200-mph R10 diesel prototypes at the world's greatest road race. He jumped into one of the most complex and expensive racing cars in existence, at one of the longest and most grueling races on earth. Despite having no experience with either, he did damn well. How well? If trackside gossip is true, one of the pro drivers on Tucker's team — a French veteran brought on to drive fast and not hurt the car — crashed twice while trying to match Tucker's lap times. Feathers were ruffled. Le Mans is not a small race. The event takes place on an eight-mile circuit composed of purpose-built roads and repurposed French highways. Over the course of 24 hours of racing, this year's winner completed 397 laps — roughly the distance from New York to London — at an average speed of just under 140 mph. The cars regularly reach speeds of 200 mph or more on the track's longest straight, which is nothing more than a narrow, closed-off public two-lane. 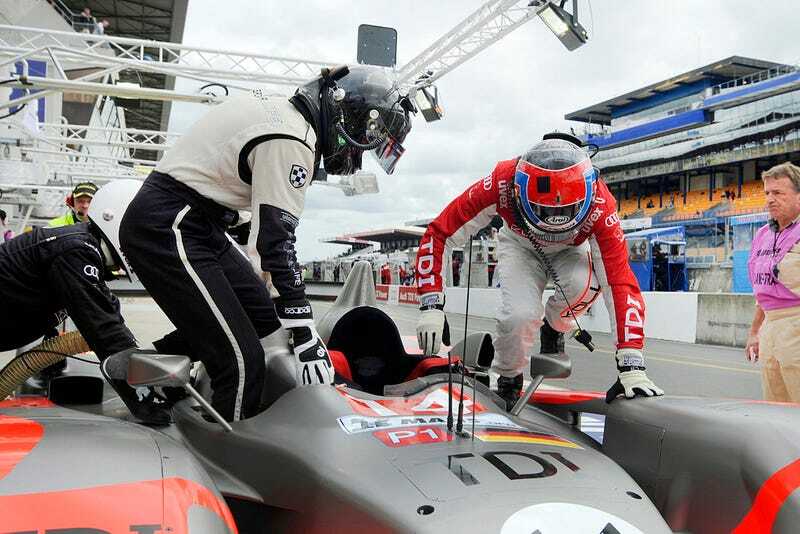 Audi has won Le Mans nine times in the past eleven years, but the German company's efforts have always been relatively closed — the firm has shied away from putting anyone other than proven winners in its cars, much less non-Europeans. In other words, you cannot just fly to France, throw a bunch of money around, and hop into the cockpit of a top-level prototype. You have to have talent. Tucker does. In the four years since he began racing — he essentially entered the sport on a lark, and because it looked like fun — he has competed in an amazing 91 events (! ), gaining as much seat time as the average driver sees in a decade. In that time, he has won an astonishing 40 races and been on the podium 52 times. Le Mans is known for eating drivers and cars whole. Tucker's car didn't survive, but he did, and he experienced something most people only dream about. We spoke with him by phone last week. You went to Le Mans. For the first time. In a diesel Audi prototype. What was it like? It was an intimidating and challenging experience, being there for the first time. It was a lot to take in, as any big event is — you don't really even realize what you went through until after the event is over and you've had time to think about it. Le Mans doesn't really have a rhythm — actually, it's got a rhythm, it's just a weird rhythm. The race starts on Saturday, but the actual run-up lasts a week, correct? I've heard it's very French, very elaborate, very full of pomp and circumstance. It's strange. You get there on Sunday, your cars go through parc ferme (the mandatory holding lot that ensures no work is performed on the vehicles —Ed. ), and they take your picture in town. Monday, nothing goes on. Tuesday, there's a driver's meeting at ten in the morning, but that's it. On Wednesday, the first practice session is at four in the afternoon. Qualifying is that night, from ten to midnight. By the time you wrap up everything connected to that, it's two or three in the morning. Thursday, nothing happens until four in the afternoon, with another ten o'clock qualifying session. Friday, there's a parade late in the day. Saturday comes, and you're still sitting around a lot without much to do. It was a great experience, but for your first time, it was a little… it's hard to put into words. The quicker prototypes regularly see straight-line speeds approaching 200 mph. A lot of the track is composed of unlit, repurposed public highway, though the cars do have headlights. What was it like going that fast at night? The night definitely brings out a different element. It takes some acclimation, and you definitely have to adjust to it, but it's very rewarding. Especially down the Mulsanne, the longest straight on the course. It's not lit, and one of the fastest corners on the track is not lit. You kind of become one with the car. You've heard about how blind people and people with other sensory impairments adapt? It's the same thing. Your other senses work overtime and offset what you don't have. We were eventually turning the same [lap]times at night that we were in the daytime. Tucker's car qualified with a lap time of 3:30.907, enough to put the team 14th on the starting grid. One of his co-drivers, a French Le Mans veteran named Manu Rodrigues, crashed during qualifying. He went off the track at Tetre Rouge and brushed the wall. Mechanics were able to repair the damage, but the exact cause of the crash has not been released. The first night of practice was a struggle. You're out there — whew. Guys are flat-out moving, the Peugeots just fly by you. I was trying to take it easy. You get used to it, though — a lot changes after the first night. I think that's why a lot of guys say that the most rewarding part of driving at Le Mans is driving at night. What's qualifying like for a first-timer? You can't just show up as a rookie and run the race, can you? Talk about intimidating and challenging — in order for a rookie to qualify at Le Mans, you have to do a minimum of ten laps and keep your speed within a certain percentage of the class's fast time. In previous years, you could go and practice beforehand, but this year, they got rid of that and tossed the rookies like me to the maneaters. You're really out there with ‘em, and the lap percentages are fairly small. Le Mans is a big track — almost eight and a half miles long. And ten laps may not sound like a lot, either, but that's about how long our driver stints were during the race. Tucker (far right) with Christophe Bouchut (middle), his driving mentor and Le Mans co-driver, and an unnamed Audi/Kolles Motorsport employee. Photo: Bill Caswell. You basically went from stone-cold rookie — you once said that, prior to your first sports-car race five years ago, you had never even seen a race track — to competing at the front, in the fastest class, in one of the most complicated race cars on the planet, at the greatest race in the world. How far out was this planned? Le Mans is a magical place. It's much different than Sebring or Daytona, including how you get there. The whole deal came about — there are so many twists and turns to it — at [almost the last minute]. Audi had three R15s and two R10s at the race. I was originally not a part — I was going to drive a Ferrari, but that deal fell through. Bouchut knows the guys at Kolles, and we were able to put together deal back in February. It was an Audi and Audi Sport effort and partnership, even at the test. Everyone was running around speaking German. you've driven everything from Ferrari Challenge cars to Daytona Prototypes. What was the Audi like in comparison? Big. Big and heavy. It's larger and fatter than a Daytona car, but the biggest adjustment was the diesel motor. When you start it, it sounds like a tractor. Once you get some revs into it, it quiets down and you can't hear it. If you don't watch the gauges, you don't know when to shift. The car makes power from 3000 to 5000 rpm, and after that, it's done. It's like a typical turbo car — you wait for the boost pressure to build, for the turbos to spool up, and then bam, it hits. You've almost got to drive it like a momentum car — a car with lots of grip but no power. You have to keep the powerband and revs up in the slow stuff and get back on the gas early so you have power when you need it instead of waiting for the turbos to come online. The R10 was built for Le Mans — they built it specifically for that track, and you can tell. Once you get it up to speed and it starts producing downforce, it's like you're on a rail. I like the prototypes — they're both easier and harder to drive than a [production-based car]. Those cars have a lot more room for error, and you can shove them around a bit, but a prototype, you drive it on the edge, and it's either gripping or not. At 4:18 AM on the second day of the race, after 331 laps, the car crashed for the second and final time. Rodrigues was driving. At one point, the team had climbed as high as seventh place. Photo: Bill Caswell. Your race ended early, though you weren't in the car at the time. What happened? Retirement? The car was running great. I wasn't in it when it retired — it was our third driver, at about four in the morning, so eight hours early. He lost control of the car in the Porsche curves. He hit the wall, got out of the car, and walked more than ten meters away. Once you do that, the marshals automatically disqualify you. We probably could have brought the car back to the pits; the curves are right there at the end of the track. We're still not totally sure what happened. Bouchut, frustrated by the events of the day, throws a water bottle out of the car before his stint. Note the wear and tear on the Audi's bodywork. Photo: Bill Caswell. Are you going to try to go back? It depends. I'm the points leader in the American Le Mans Challenge class, so we're probably going to concentrate on that next year. The problem with Le Mans is that it's so fluid — the ACO (Automobile Club de l'Ouest, the French sanctioning body that governs Le Mans — Ed.) changes the rules so often that it's hard to pinpoint a deal on a car and what you want to do. But a lot [of my career] has been like this. I didn't have plans to go this far when I started, and it just kind of evolved. None of it has been formal — it's more like "let's try that," then, "hey, let's see if we can do this." Of course. Naturally. Congratulations on getting to Le Mans, on being the first American to drive an R10, on being fast, on all of it. It's all very, very cool. Will you adopt me? Please? Follow Scott Tucker and his team at Level 5 Motorsports. You can also find them on Facebook, Flickr, and Twitter. Photo Credits: Drive Digital Media/Bob Chapman unless noted. Le Mans grandstand shot: Bill Caswell.